Most people who work in creative fields are jockeying to land a leading role, a front-page story, or first prize in an art competition. Aiming high, we usually compete for the spotlight. We’re all trying to make it in a culture that worships overnight success and holds its collective breath for the latest American Idol winner. So, who’d want to work long, repetitive hours as a background extra in films? Who’d get a kick out of working for little more than minimum wage and a few fleeting seconds of screen time? Lots of people. And I’m one of them. Thanks to Michigan’s new film incentive program, Hollywood has been sending a variety of productions to our state, creating thousands of new jobs for labor, crew, and actors. My first gig as a background extra in a feature film began on a lark last fall — another item on my bucket list. Along with my husband Doug and several of our neighbors, I was cast in the opening scene of the big-budget Red Dawn remake when our own neighborhood was used as a film set. Humvees and assorted army vehicles rolled down our tree-lined suburban streets while a troop of gun-wielding Communist soldiers took us captive. It was a total blast, literally and figuratively, and some of us were called back to work in additional scenes in Detroit. Now that we’re listed with casting agencies, the toughest part is learning to deal with the unpredictability. We might get a call or an e-mail inquiring about our availability a week (or a day) before a particular shoot. At that point, we must commit to a time frame — with no immediate guarantee that we’ll be booked for the job. We’re usually left hanging until the casting agents confirm our roles and send additional details. The agents aren’t being coy or cruel — they’re also waiting for a schedule from the production people. Pay rates vary, depending on each film’s budget. As a rule, hourly pay is rarely much more than minimum wage, so I wouldn’t advise anyone interested in this work to consider quitting your day job or ditching your best freelance clients. There’s always a chance that your 15 seconds of “face time” will end up on the proverbial cutting room floor, anyway. But there are untold rewards, especially if you love movies as much as I do. For starters, background extras get a rare look behind the scenes and a chance to learn more about filmmaking. This takes most of the glitter out of the stardust, yet you can’t help but return home with a deeper respect for the hard work and long hours invested in any given film project. You meet some of the nicest people too — everyone from legal administrators to retired engineers and stay-at-home dads will show up for work. And yes, sometimes you do rub elbows with celebrities. For me, film work provides an interesting contrast to my (real-life) role as a professional writer. Writers are often loners out of necessity — but we enjoy company too. Working in a film, I enjoy the same rush of adrenaline and camaraderie I used to get when I was in theater years ago. I thrived on the nervous hum of activity backstage while the crew geared up and my fellow actors prepped for their scenes. Last week I worked as a background extra in an HBO television series. I was waiting for my cue from an assistant director half my age when it hit me that this sort of work is both humbling and freeing. No matter which production I’m working for, I know I’m just a very small part of a much bigger picture. I have no lines to memorize or deliver, and mugging for the camera is strictly prohibited. Unlike writing a story — where I’m in creative control and get my own byline — I’m merely fulfilling someone else’s vision while working as an extra. My role in a film might be as simple as running across the street from an explosion, singing hymns in a church, working at a desk, hanging around the town square, or standing in a corner with a drink in hand. Years ago, I worked with a director who liked to remind everyone on stage that “there are no small parts, just small actors.” And that’s still terrific advice for every performer. Top photo: I’m on the right, hamming it up with Laurie and Bryan Valko, fellow background extras, after getting fitted for a hospital scene in Secrets in the Walls, a Lifetime TV thriller scheduled to air this fall. Middle photo: My husband Doug (left) posting with background extra Vong Lee, the Communist soldier who held us captive on the set of Red Dawn in our Royal Oak neighborhood last year. Bottom Photo: One of several head shots I use for background extra gigs. This entry was posted in Events & news, Just for writers and tagged background extras, casting agents, Douglas Gorenstein, experienced background extras, film and television, film extras, jobs for retirees, Michigan film extras, Michigan film incentive, Michigan films, midlife reinvention, performing arts, Red Dawn extras, Red Dawn remake, Secrets in the Walls, theatre by Cindy La Ferle. Bookmark the permalink. 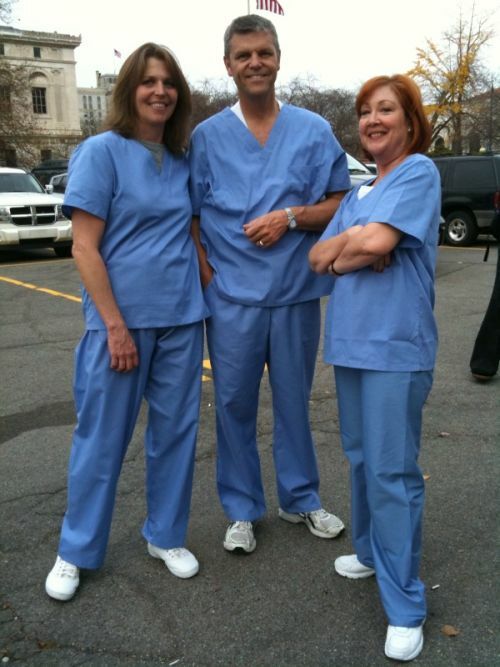 You are rockin’ the scrubs … Grey’s may be in your future … and Doug? A “Mc” doctor too! Hey Cindy- thanks for this post! I have been wondering about the realities of your new pastime and this draws a complete picture for me. You and Doug look adorable in the snapshots, and, what could be more fun than finding a common interest to share with your partner? Way to go! Well I must say, you certainly know how to have fun! What exciting ventures these sound like. And I kind of like the spontaneity of getting that call, and the different roles that come up. And it sounds like, in some way, it even can expand your understanding of writing at the same time. Having lived in LA for almost 20 yrs I a little familiar movies being made. I know and have a few friends that actually make a good living working as movie extras, and sometimes they get to travel as well. Well look at you, a woman of many talents! and I do think it’s a brilliant way to spend time together as a couple. the spontaneity must be like a little rush, adding excitement to the whole process. thanks for sharing all the pictures . You radiate . This was fun – a behind the scenes look at your work behind the scenes. cindy, I knew about Red Dawn but not the other shows. This is so cool. YEAH YOU! What a fun thing to do! I’ve read about all the filming in Michigan lately and think it’s GREAT (although don’t tell that to my fellow Californians). I’ll be watching the background for you!!! Cindy H — I’ve worked in four productions so far. It’s been loads of fun, and I have learned something new and different from each one. That’s so cool, Cindy! I do hope to see you in something soon, closely watching the background. Oh what fun! You found a new way to play! Cindy – I loved this piece! You said it all for the hundreds of crazy movie lovers that do this. Hope to see you on set soon! The pictures and words seem so familiar as they reflect a part of my past too. I have a picture of me in scrubs from when I played a doctor in an industrial training film. 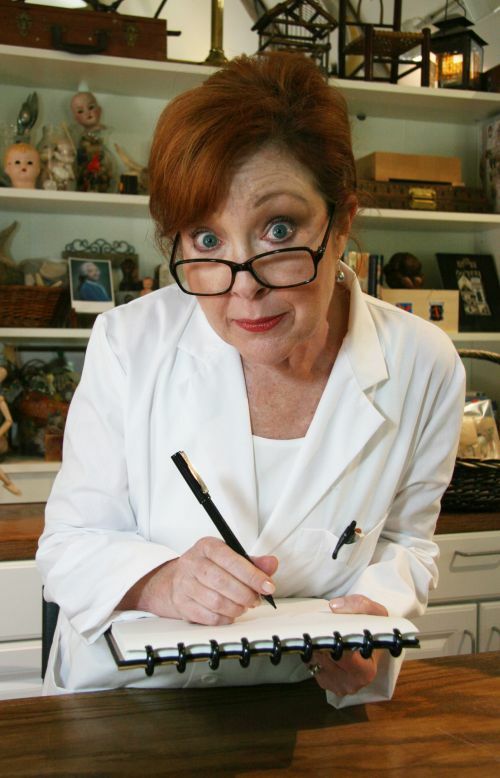 With a degree in drama education, I built a career in pharma sales, but worked as an actor on the side. I started with extra work when I moved from stage to camera and have many stories regarding those days. Interestingly, even though I did a few day player things where I was a principal on camera with more visibility, it was in an extra scene with Kevin Kline and Forest Whitaker that you can see me long enough to pick me out of the scene. My work in Georgia and Alabama was more related to commercials and industrials, but I did show up in a night time soap filmed there too. Have you considered moving up from extra work to auditioning for larger roles? It might be fun for you. Hmm, I feel a blog post coming on. Elizabeth — that is so cool. I didn’t know that about you. As someone else commented on another post, it’s amazing how much we get to know about each through blogging, isn’t it? I can’t wait for your post about your acting career! I have thought about auditioning for speaking roles in film … I did a lot of work in theater years ago, as hinted in this post, and often had good speaking parts. I loved it. But there is a lot of work involved in auditioning and it’s a part-time job just keeping abreast of what’s available out there. And competition is fierce, making it twice as much work to stay in the game. You took the words right out of my mouth, Cindy. And, most of all, I always seem to be smiling after an 11 1/2 hour day on the set somewhere. Cindy, I’m just catching up again on my favorite blogs, and I loved this post. I think what you and Doug are doing is great fun, and, of course, it’s yet another way to communicate. By the way, I loved this phrase from your blog: “This takes most of the glitter out of the stardust.” However, from your post, I can tell that you still like the stardust — even without the glitter! Thanks so much, everyone, for these great comments! I’m especially tickled to read remarks and kudos from fellow background actors who’ve been working at this for a while. Howard, I like the way you said you find yourself smiling after a day on set! As of early July, I’ve worked on 8 different film projects since beginning this adventure 10 months ago. It’s wonderful for Michigan that we have so many films in production in our state, as they provide employment for so many people — not just actors. Awesome! I would LOVE to do this as soon as my schedule is more permitting. I see the mad scientist photo is not new. Love it. Thanks, all, for your supportive comments! Ellen, the photo was taken this spring.